Jellyfish caps propelling onwards amid frantic waves. It crouched. As though blind to our fervor. A marvel of either science or magic. In their indigenous tongue, the natives said that it was the real deal. Yes—they said without hesitation—it would burn and be reborn. The prehistoric bird’s favorite fruit had gone extinct. We must not expect too great a show for our fallen world. And sputter in the cage on the scaffold. That’s what the news anchorwoman chirped around the world. While the ancient bird raised its beak. Its own scaly talons to sprawl and smolder. As its faded feathers flaked. A few puny purplish flames flickered. The naturalists had indeed protested that this phoenix was too old. They had stressed that it might not perform. It might be altogether barren. The bird matched the scientific estimation of its impotence. From faraway countries to behold and bow to the divine blaze. A florid rebirth from the corrupt morass into which we had sunk. True believers held their breath. Their souls awaited the cleansing ruby conflagration. The phoenix tried to sing its song of fire. Charred fragments of brittle cerise vertebrae and sluggish ochre cartilage. Crimson wheezes spattered from consumptive lungs. Wafted with the scent of death to every nostril. Then something stirred under the earth. The paltry embers of the once mythic bird. We watched in horror at the sheer size of this strange thing from the hidden abyss. Slunk again below the very earth which rolled bneath us. What were we fertilizing under the ground? Had apocalyptic anticipation sickened our savior? Had our despair ruined our blazing deliverance? Then, a burst of cheers! Shot finally forth from the underworld maw. Fire was indeed the new incarnation. That silenced the hollering halleluiahs and seared the eyes of the prophets. We were sorry that we had ever prayed to watch the world burn. Jason Marc Harris graduated with a Ph.D. in English Literature from the University of Washington, and an MFA in fiction from Bowling Green State University, where he served as Fiction Editor of Mid-American Review. Stories in Arroyo Literary Review, Body Parts Magazine: The Journal of Horror and Erotica, Bull, Cheap Pop, EveryDay Fiction, Jellyfish Review, Masque and Spectacle, Marvels and Tales, Meat for Tea: The Valley Review, Midwestern Gothic The Offbeat, Psychopomp Magazine, and Riding Light Review. Books include Folklore and the Fantastic in Nineteenth-Century British Fiction and (with Birke Duncan) Laugh Without Guilt: A Clean Joke Book and The Troll Tale and Other Scary Stories. He teaches creative writing, folklore, and literature at Texas A&M University in College Station, TX. Editor’s Notes: This narrative poem is experimental using structural elements in a way that isn’t typically seen. The line breaks are not necessarily enjambed, but image and rhythm driven. 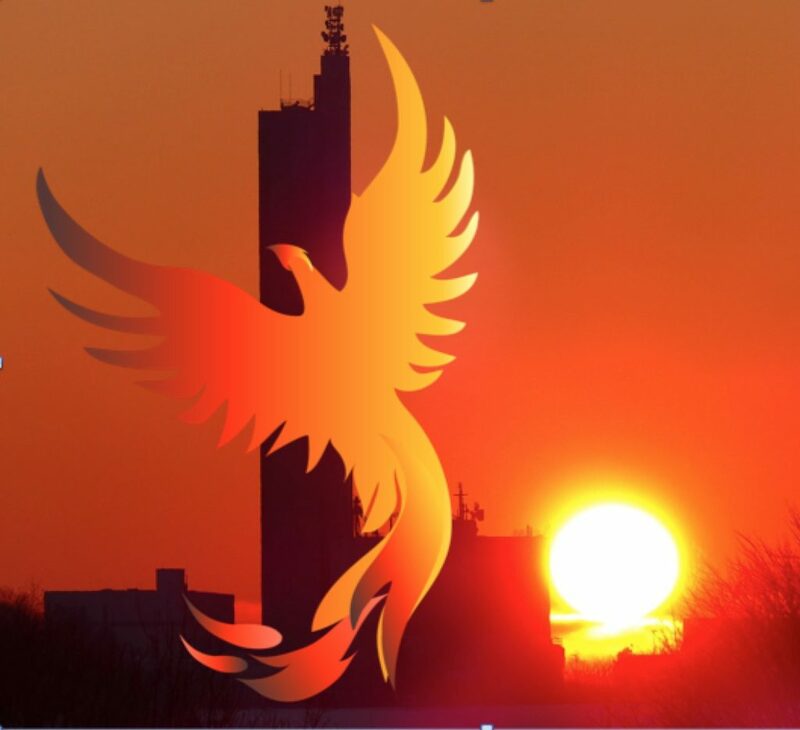 The complementing image is a sunset afterglow with lots of implied possibilities and the legendary Phoenix.